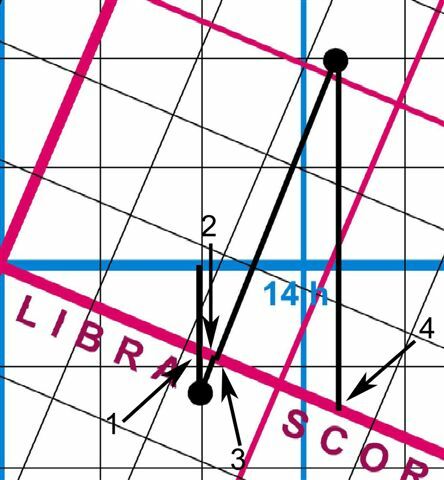 There are two basic chart forms in use in astrology. 1. A circle is divided into 12 equal parts or 12 houses, and the sign position at the cusp of each house are written down on the outside of the circle. This is the house based or equatorial chart system. Here the houses are equal and the special positions of the planets are distorted, but placed in the house so that the main factors can be seen easily. 2. A circular band is divided into twelve equal parts for the twelve zodiac signs. The houses are then drawn in placing them in the actual degree they are in. 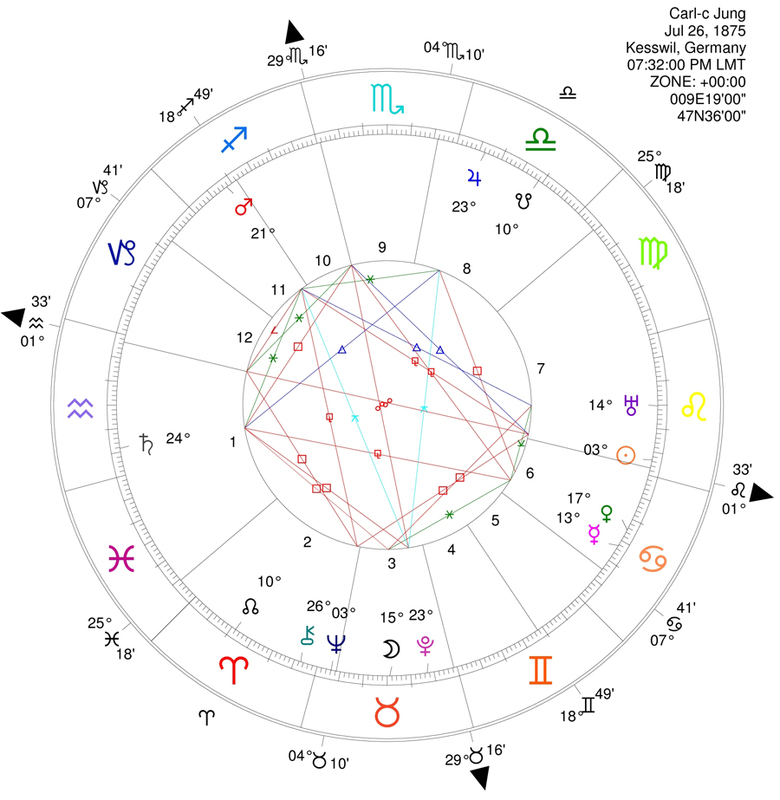 This is the ecliptic chart system. 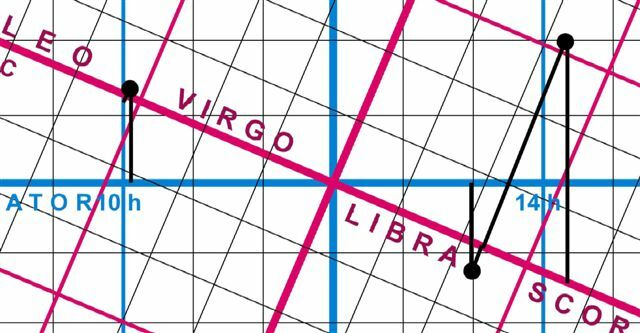 Here the signs are equal and the houses unequal but the planets are able to be seen in their exact angular alignments. In chart form 1: the planets are simply drawn into the house they are in and their zodiac position is written beside the planet symbol. In chart form 2: the planets are placed, usually with a line to the exact zodiac sign and degree they are in. In both systems the aspects are calculated by using the zodiac positions. The ecliptic system tends to be more graphic in its representation of the heavens. You can look at it and go out and see the planets where they are in the sky. The equatorial system, loses the quick visual recognition of aspects and requires them to be calculated in one way or another. The equatorial system accentuates the houses as the primary factors. The planets then affect the affairs of the house it is in. Simple, clear and easy to focus on. The ecliptic system accentuates the signs proportionally and then draws in the houses. This could be a big article in itself, but my point here is that there is a difference in each perspective. A good comparison would be to think of the chart of each system as one of our eyes. Each sees a little differently. If you hold your finger up in front of you and close your left eye, there will be a specific background behind it. If you close your right eye there will be a very different background behind it. You are still looking at the same finger and the same environment but a distinction appears. These distinctions are the ones astrologers and astronomers argue over. Astrologers tend to use zodiac longitude and latitude based on the ecliptic. 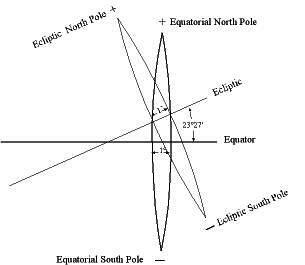 Astronomers tend to use right ascension and declination on the equator. One measures the rotation of the earth and the other the orbit of the earth around the sun. One measures the cycle of a day while the other measures the cycle of the year. Both circles are used to measure positions in the heavens around them. There are distinctions between them. It is with such distinctions, that this article on progressions and stars, is concerned. We will take the horoscope of psychologist Carl Jung and observe his progressed sun across his life. This was presented in the previous article entitled Fixed Stars and Progressions in Carl Jung’s life. In his entire life Jung’s progressed sun only touches three first magnitude fixed stars: Regulus, Spica and Arcturus. Spica and Arcturus are within the same degree, so this appears as two basic periods instead of three. 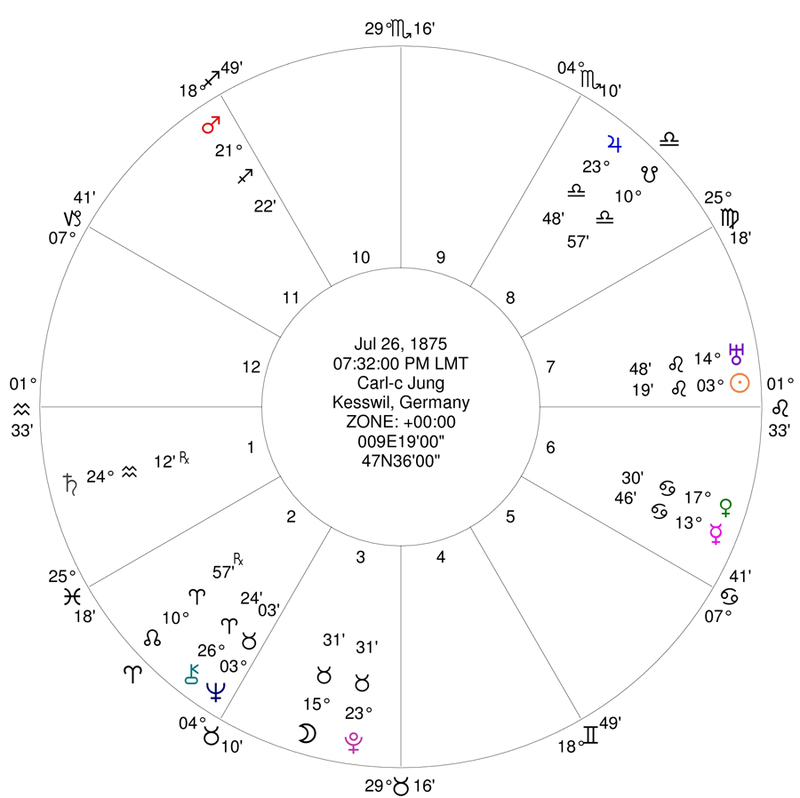 The progressed sun was measured in the tropical (ecliptic) zodiac and when it reached the same degree position as each star, the conjunction is recorded and the life events studied. Unfortunately this only tells half of the story! If we were to watch the secondary progressions of the sun on the equatorial axis we would have three different dates for these conjunctions. To find this information you will also have to calculate the secondary progressions in the equatorial system. The same would hold true for transits. The times of conjunctions are different! A few drawings will help to see the distinctions. Here we will look at an exaggerated first degree of tropical (ecliptic) Aries and of equatorial (Right ascension) Aries. You will notice that they share some space in common but also include much different areas. 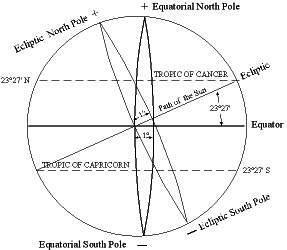 In the ecliptic zodiac we have longitude and latitude. In the equatorial divisions we have right ascension and declinations. These are clearly two different systems. A mathematical analogy would be to consider the relationship between two coordinate systems: x and y is the first, and x1 and y1 is the second. A position can be reliably placed only if one stays within the same coordinate system. x and y would be correct. x1 and y1 would also be correct. X and Y1 , or X1 and Y would both be wrong. 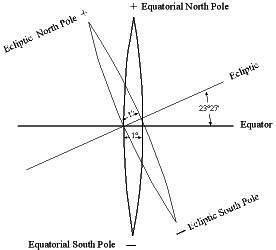 The diagram above shows a simpler version of the first degree of each system where the ecliptic and equator cross each other. This diagram shows how the distinct a similar degree further away from the starting point would appear. If you imagine a planet at a high or low latitude (ecliptic) then you will see the phenomena being presented. 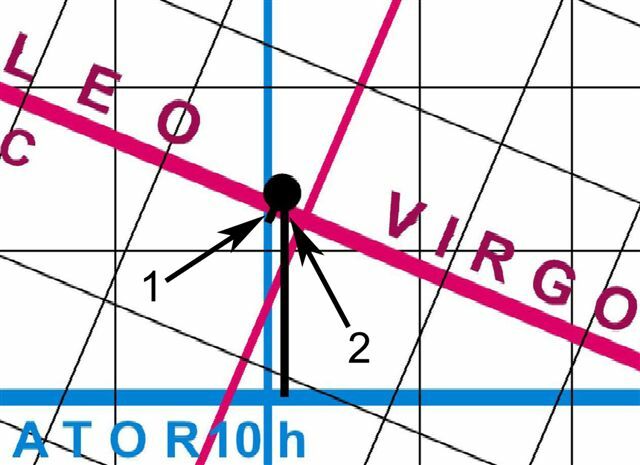 The house degrees from the equator cross the ecliptic or zodiac at a non-perpendicular angle. This means that in some cases, a planet in the first house may actually be in the twelfth or vice versa. That’s another article! You should be starting to see the distinctions in the systems. In the following diagram the stars of Regulus, Spica and Arcturus are positioned. The red line represents the ecliptic or path of the sun (earth). The blue horizontal line represents the equator. Let us look more closely at Regulus first. Arrow 1 marks the exact position in the zodiac. Arrow 2 points to the black line that marks the exact position of Regulus in the equatorial system. Arrow two however is pointing to the zodiac position where the second conjunction occurs. This can be seen more clearly with Spica and Arcturus. Here again we see the different position in each system. The points accentuated are the position in the zodiac where each star has its double influence. These points will allow us to get much more detail out of the progressed sun’s sequence of stellar conjunctions. Arrow 1 points to where the equatorial position of Spica (just below the ecliptic) intersects with the zodiac. Arrow 2 points to the exact position of Spica in the zodiac. Arrow 3 points to the exact position of Arcturus in the zodiac. Arrow 4 points to where the equatorial position of Arcturus (far above the ecliptic) intersects with the zodiac. What happens in effect is that each star has a phase of influence with peaks at the beginning and ending conjunctions. As Jung’s sun progresses it will run into the Regulus influences. Because Regulus is almost on the ecliptic there will be a short period or phase between each conjunction. Likewise with Spica, however Arcturus because of its distance above the ecliptic will have a long phase of influence with peaks at each end. Carl Jung’s Progressed Sun to Regulus, Spica and Arcturus. Jung graduates with M.D. from University of Zurich. which would probably be in May. This is the first touch with Regulus. The effect would have begun about a year earlier. This would include most of his final studies and work to get his M.D. Jung secures a job as an assistant at the Burghoelzli Mental Hospital in Zurich, where he would work for the next nine years. This conjunction would maintain its effect for about one more year. In 1902 Carl Jung received his Ph.D. at the University of Zurich. Jung established his status with his masters and his doctorate degrees. He was now ruler of his own destiny! In the process, he did add a special light to his own life purpose and direction. By 1903 Jung Married Emma Rauschendbach who became his close collaborator until her death in 1955. So the two previous years and degree accomplishments were his alone to shine in! Reaching this level of achievement on his own, Jung then decided he would venture on with a partner. “Mystery Coniunctionis”, Volume I (GW 14, I) was published. Emma Jung died on Nov. 27, 1955. She wrote a book, “The Grail legend in psychological terms”, with an introduction by Marie-Louise von Franz..
“Mystery Coniunctionis”, Volume II (GW 14.II) was published. The book set the final points about the juxtaposition of alchemy and the psychology of the unconscious, and is considered by many to be Jung’s main work. In the following last years of his life Jung dedicated several hours every day to his young correspondent (GW letters). In these many letters he has clarified in a concrete and vivid way the Essentials of Analytical Psychology. In “Mystery Coniunctionis” Jung refers to the mysterious conjunctions of the Sun and Moon. But it is fascinating that the mysterious conjunctions of His Progressed Sun to two of the brightest stars in the sky was happening at the same time. This would add some extra special light to the inner purpose of Carl Jung. Perhaps just enough to put him in a league of his own understanding! Jung’s book,”Undiscovered Self” (“Gegenwart und Zukunft”) is published. From 1956 the idea of a personal biography began to develop. Jung, who was always very cautious about details in his personal life, opened up to his young secretary. He started telling her about his life and responding to her questions. By the end of the year he was writing some of it down himself. This lead to the publication of “Memories, Dreams and Reflections” in 1963. He also found time to do four, one hour film interviews, and talks for Swiss radio. Eight years after Jung’s death two of what was to be his most popular books were published. “Man and His Symbols” was published as a mass market paperback by Dell in 1968. “Analytical Psychology-Its Theory and Practice : (The Tavistock Lectures, 1935)” was first published in 1970. This was considered by some to be the best introduction to the work of Carl Gustav Jung for anyone seriously interested. Man and His Symbols was more of a coffee table approach, but this book got one into the depths of analytical psychology. These two publications marked a surge in the awareness of Jungian psychology. They certainly enhanced the development of analytical psychology or Jungian analysis. New light and prominence came to Carl Jung’s work through these publications, perhaps in proportion to the light of Arcturus on Jung’s posthumous conjunction of his progressed Sun to Arcturus by right ascension.